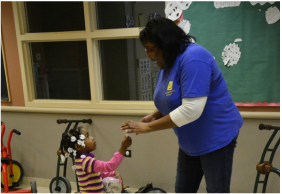 Healthy Minds, Healthy Schools is Gads Hill Center's comprehensive mental health program targeting the needs of children and families in Chicago's underserved communities. This program is founded on the belief that empowering individuals through relationships will enable them to transform their lives. Our objective is to enhance students’ academic success, social-emotional development and wellbeing through individualized support, access to resources and community engagement. Through the program, Gads Hill Center also partners with schools and agencies to provide cooperative support and build on preexisting strengths with goals to enhance the culture and climate of these institutions. Youth with emotional difficulties suffer from higher rates of suspensions, expulsions, truancy and behavioral referrals which can impact academic performance. Nationally, approximately 14%-20% of students in public schools face serious emotional or behavioral challenges; in schools serving low-income students, this percentage increases to as high as 50% (UCLA Center for Mental Health and Schools,2003). Healthy Minds, Healthy Schools is in multiple Chicago Public Schools and provides services such as individual, group, and family therapy; home visits; psychoeducational workshops for family members; staff support and professional development to increase capacity around social-emotional issues; connection to community resources; and crisis management. Studies of child development demonstrate that the early childhood period is critical as the foundation for lifelong mental health. Disruptions in the developmental process can impair a child’s capacities for learning and relating to others. Healthy Minds, Healthy Schools offers the following services to support mental health in Gads Hill Center’s early childhood programs and Partner Network: child observations for preventative screening or targeted support; parent consultation and psychoeducational workshops; crisis management; Individualized Family Support Plan (IFSP) support; and staff consultation and professional development trainings. Such early intervention can help children overcome obstacles, increase resilience and improve long-term outcomes. ﻿The health of a program or organization is directly dependent on the wellbeing of its staff members and their emotional intelligence. A study described in Psychology Today, and published in the Journal of Organizational Behavior, identifies emotional intelligence as the strongest predictor of job performance. Healthy Minds, Healthy Schools provides professional development services that increase internal capacities by offering training on subjects that include emotional intelligence in the workplace, stress management, and team building, as well as trauma-informed strategies to address community/consumer concerns. We seek to ensure staff members can realize their full potential, both personally and professionally. Our development of services has drawn upon the clinical theories of Family Systems, Strength-based Practice, Solution Focused Brief Therapy, Check and Correct, Motivational Interviewing, Cognitive Behavioral Therapy, Multi-Tiered Systems of Support Framework (MTSS), Relational Therapy and Positive Behavioral Interventions and Support (PBIS). As students are referred to the program, clinicians conduct an assessment and set treatment goals to determine the appropriate interventions and tier level. These tiers are based on the MTSS framework and determine the types of individualized services that each student will receive and the frequency of clinician contact. Needs are identified through the implementation of a bio-psycho-social mental health assessment and include any social, psychological and economic hindrances. Gads Hill Center utilizes the empirically-based Strengths and Difficulties Questionnaire (SDQ) and Student Assessment Youth Outcomes (SAYO) as behavioral screening tools for students receiving clinical services. Individual students receive baseline measurements for conduct problems, hyperactivity, emotional symptoms, peer problems and pro-social behavior. Clinicians use initial scores to tailor services based on students’ level of need, and conduct reassessments both at the mid-point and end of the academic year. For data collection purposes, Gads Hill Center uses the secure Efforts to Outcomes (ETO) database from Social Solutions as part of the Chicago Benchmarking Collaborative, an alliance of seven education and human service agencies that collectively work with more than 12,000 low-income individuals throughout some of Chicago’s most underserved neighborhoods. We track SDQ and SAYO results in ETO, and we also collect grade, attendance and behavior incident data for each student with parent consent. Clinicians maintain general case notes on resources provided to students and families and progress towards goals. In addition, clinicians maintain quantitative data on the interventions provided for each student or family. The program is currently staffed by six Master’s-level clinical therapists who are passionate and experienced in supporting the struggles of today’s urban youth. Clinicians utilize evidence-based, culturally and linguistically-relevant interventions adapted to meet the needs of each client. Clinical supervision is provided by Director of Mental Health Services, Rosa Julia Garcia Rivera, LCPC.